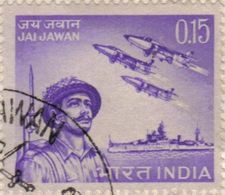 The Second of the pair of stamps from Independence Day 1963 with a C-119 Packet dropping supplies in the mountains. 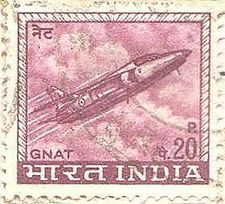 The Gnat (See the hindi pronouciation 'Nate') is the only aircraft to have been 'rewarded' with a stamp of its own in recogniition of its performance in the 1965 War. 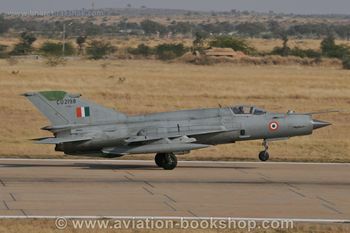 IAF Chetak over the Himalayas - Part of a set for Air Mail service in 1979. 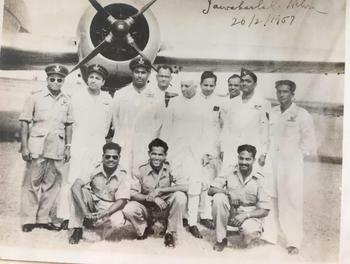 Note that the helicopter does not feature any identifying number other than the letters I.A.F. Stamp issued on the Diamond Jubilee of the No.1 Squadron Tigers 1993 - with the Squadron crest and the Westland Wapiti making the appearance again. 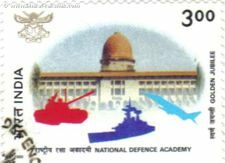 The Golden Jubilee commemoration stamp of the National Defence Academy at Khadakvasla features the Silhoutte of a Jaguar IM Fighter Bomber. 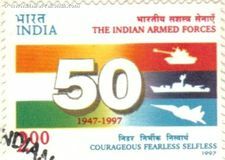 A series of stamps on PVC awardees was done in 2000 . 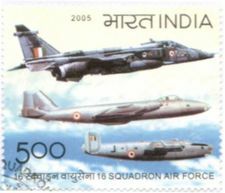 This stamp on Fg Offr NS Sekhon, PVC with a Gnat and an IAF Crest was one of the five released at that time. 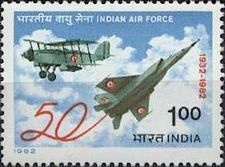 The first in the 2003 Aero India Stamp series shows the HAL HT-2 trainer, the first ever indigenous aircraft inducted into the IAF. 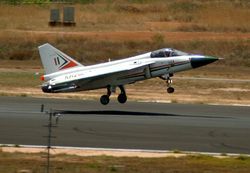 The first indigenously built fighter, the HF-24 Marut is the second in the 2003 Aero India Series. 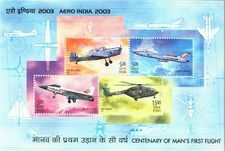 The fourth in the 2003 Aero India Stamp series shows the HAL Advanced Light Helicopter, the Dhruv. 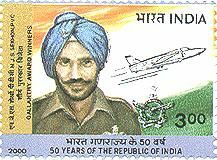 The special stamp released on the golden jubilee of No.16 Squadron "The Cobras". Note that the Liberator side profile is 'flipped' with the reversed 'L' on the fuselage. 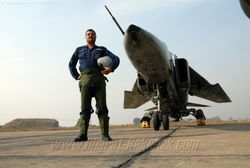 This Mini Sheet was released on the 75th Anniversary of the IAF's raising in October 2007. The Wapiti makes its appearance yet again. The fictious 'AWACS' is a surprise addition to the theme.